I was folding laundry a few days ago when I came across one of Ruby's onesies. "Mommy loves me" was printed across the front in a velvety pink font. How is that any different than a onesie that says "I breathe air," or "I am a human baby"? Moms love their babies, people. There are more subtle ways to communicate that you love your baby. Maybe a t-shirt with "This is free-trade organic hemp" screen-printed with sustainably harvested blueberry ink (only the softest fibres for little Pashmina). Or for the less environmentally inclined, how about something like, "I only watched one Daniel Tiger today, but it was while Mom was glassblowing a succulent terrarium to hang in my nursery." Inferred maternal love right there. Don't make it too easy for people to know you love your kid, and also never pass up an opportunity to mombrag. Other obvious displays I feel uneasy about include broadcasting words like "EAT" decoratively in kitchens. (I dare you to not think the word "EAT" is weird after browsing that link.) EAT EAT EAT. Gah! On one hand, typography can be mathematically and organically beautiful ... but on the other hand, I imagine what a similar display would spell out in a bathroom. I think I'm going to be smugly clever and spell out "epsilon alpha tau" on my dining room walls. Or, if we're just dealing with imperatives, let's be a little more creative. I think "Oh my heck don't eat that cockroach, Ruby," "Slam that ice cream quick before your toddler wanders in," or maybe "Procrastinate" on the wall above my kitchen desk would be nice decor additions, in glitter-decoupaged, natch. 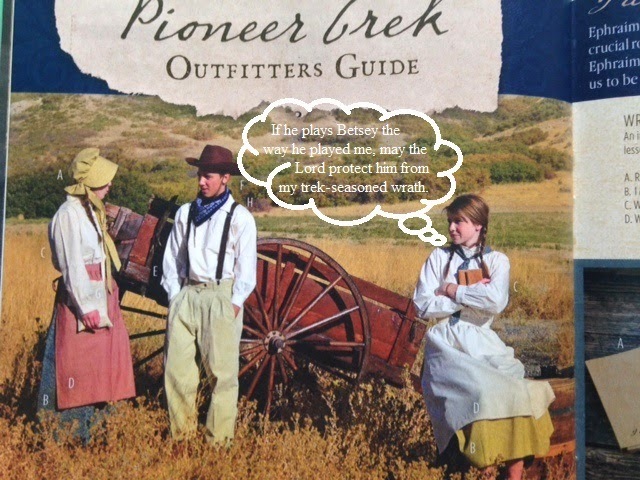 Here's something that should have been obvious ... that this picture might not be best for selling pioneer garb in the Deseret Book catalog. And for the record, I love my baby. This is a blog. You are on the internet. My "babies" are all grown up, well, almost. We ALL love your baby! Kimber vs the Koala ... and a Giveaway!